Reverbnation also has some of our tracks and videos. 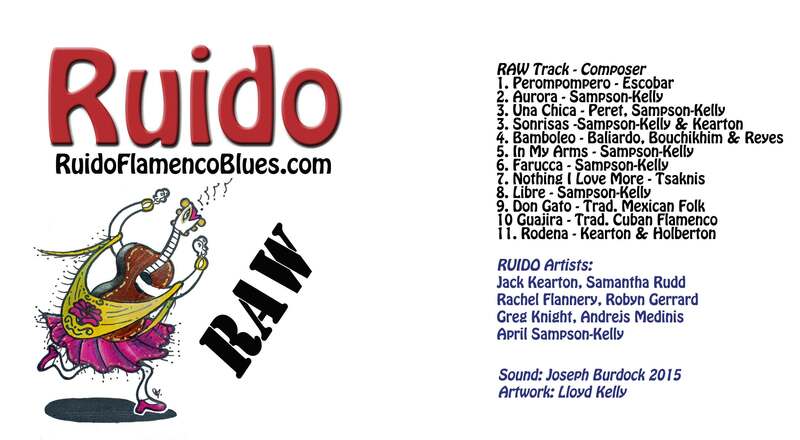 In true flamenco style, Ruido write most of their own music. They are constantly improvising and developing material. They embrace collaborations as these enable a rich exchange of music and dance ideas. Ruido play a wide range of flamenco palos (sub-genres) including their profound and award-winning Martinette, Siguiriyas. Ruido also cover traditional popular flamenco works such as Cuban flamenco Guajira, Spanish Folk Dance Sevillianas, and Spanish language pop songs ie. Feliz Navidad, Don Gato, Perompompero, Bamboleo, Verde. Their wide repertoire is tailored to suit each occasion. They have performed for many festivals, fundraisers, birthday parties, weddings, and fiestas.